I love reality TV. I know it isn't popular to say it, and it might, just might, be contributing to the downfall of our civilization, but it's true. I do. I don't watch because I want to escape into other people's lives (because, let's be honest, no one on reality TV has a life that seems stable, normal....decent), but because it makes me feel a smidge better about my own failings. So, when my children are tyrants or my house a disaster, there is nothing like "The Nanny" or "Hoarders" to set me straight. These shows always let us know that things could be much, much, worse. So, what does any of this have to do with lamb meatballs? Well, one time I was watching an episode of "The Nanny" and saw this family trying to eat dinner while their children screamed, rolled on the floor, and acted like one variety of jerk or another. And I saw that the food the children were complaining about, REFUSING to eat, was lamb chops. Lamb chops! $20/lb lamb chops. I turned to my husband (who loves this reality show stuff too, although will never admit it) and said, "can you believe these little jerks are refusing to eat lamb chops?!?). He said, "Sydney, they live in New Zealand, lamb is so common there it's like chicken here). So, I immediately put New Zealand on my list of places to visit once I win the lottery. Because I love lamb. It is so delicious. And after making the green tahini dip from Melissa's Clark's new cookbook "Dinner" about 5 times last week, I decided I just HAD to make it again, but this time serve it with lamb meatballs. This would be so good served with rice, on a fresh pita, or in a butter lettuce cup or steamed collard wrap. 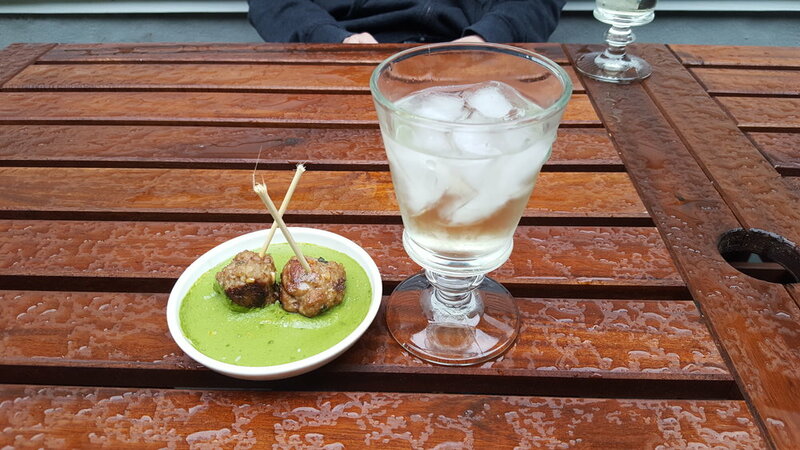 It is also really good served on top of the dip with cheap white wine and ice cubes. 1/3 cup packed chopped fresh herbs such as mint, dill, basil, and parsley. Bring kettle of water to boil. Put greens into a colander set in the sink, an pour boiling water over them (this blanches them and drains them at the same time). Run cold water over the greens until they are cool enough to handle. Vigorously press and squeeze out as much water as possible. Combine all ingredients in large bowl. Stir and knead with hands until just combined. Heat canola oil in heavy cast iron pan. Once hot, place meatballs in the pan and brown on one side. Once they are deep brown, turn them over, until all meatballs are nearly completely brown. Place in oven in pan for 10-15 minutes until cooked through. 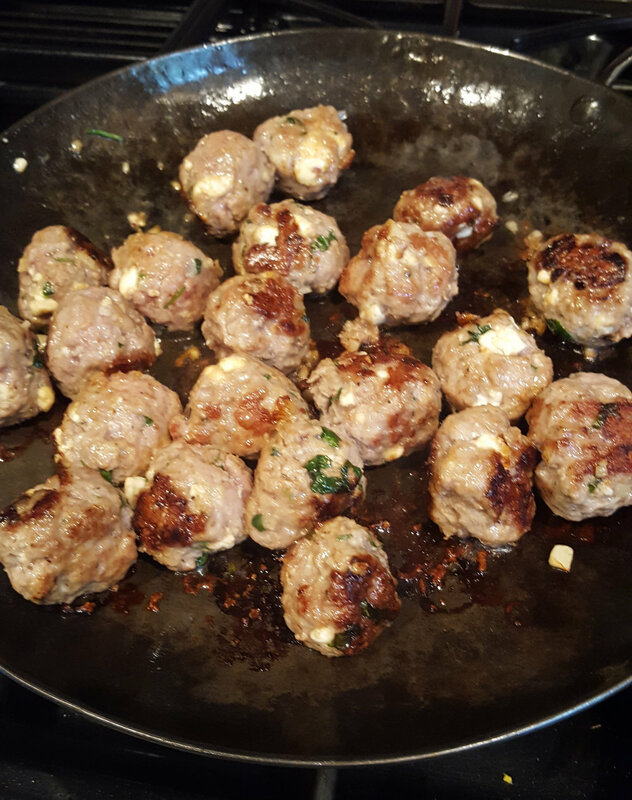 Remove from oven and squeeze juice of 1/2 lemon over meatballs. Serve hot or warm.